Sometimes it is quite difficult to pinpoint the one expertise in medical and dental science, which would provide the solution required. In cosmetic corrections and aesthetic matters, this becomes further complicated as a number of specialisations are then required to create the most effective results. Some people require a little touch up to give the glow, while there are others, for whom a bevy of procedures are required to creating the best looks. In case of the face, the role of tooth is extremely important these days, as a smile can tell a lot about a person’s personality. Smiling disposition is also quite welcome in everyday life and its need is strongly felt in the competitive world. When the face is required to be beautified, the start has to be done from the dental appearance, as it will be the first to be noticed by people. hence, smile makeover is an important part of the personal appearance of the person. Smile makeover is usually the work of a dentist, which includes the expertise from various specialities. Expertise from orthodontics, prosthodontics, periodontics and few other specialisations can help in giving a proper shape to the teeth. If required, maxillofacial surgery has also to be done, in order to create the right shape to the bony structures near the tooth. Hence, smile makeover can be a simple process like teeth whitening or can include a number of processes of veneering, bonding, braces and artificial implants. Mostly, there are cosmetic dental procedures required which can include porcelain veneers, teeth recontouring, ceramic crowns, tooth whitening, gum depigmentation and a few other processes required to be done in the front tooth, to make them look set and perfect. For smile makeover, we have the best approach by providing a detailed plan to the person by various diagnostic tests and assessments. Dental clinic in India can invite the expertise of a number of dentists to carry out this assessment and based on this, a detailed planning is necessary. Overall facial features are taken into account and the necessary steps are planned in our Dental clinic in Delhi, under the guidance of dentists. Patients may require bonding, veneers, invasalign or other procedures as per the degree of the distortion of the teeth. Best way to approach these solutions is by providing them with an assessment plan and then working on different steps at different sittings. 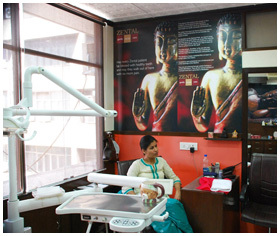 At the dental clinic in Delhi, we have the process of bonding for the purpose of smile makeover. Bonding is a simple process of beautifying the smile by making small changes in the field of front teeth, which are exposed to the outside. This process includes concealing small imperfections like chipped tooth, small spacing, dark stains and disproportions in teeth. In such a process, special resin materials of tooth colour are put in place of the imperfections, in such a way that the teeth look natural. Gaps can also be filled in this manner, by putting the resin materials in the nook and corners. To carry out the process of bonding, a conditioning solution is first applied over the surface of the enamel. This is called priming, which increases the roughness of the surface, so that the resin holds strongly to this place, allowing for long term composite clinging to the surface. Bonding in all cases, done in our clinic in Delhi can last for many years. Crown is another way for smile makeover by turning an infected or decayed tooth to look like a fresh new tooth. In case of such crowning, a hollowed tooth is fitted over a severely worn out tooth, so that there is a new look to the tooth. By doing this, the tooth is protected from all sides, in contrast to veneers, which provide the protection from the front only. Tooth contouring is another design by our clinic in India, which helps in giving a regular shape to the teeth. Uneven or crooked teeth can be made beautiful again by adding the effects of tooth contouring. Simply smoothening the edges of the tooth can give a fresh look to the teeth. Such method can be helpful in giving an appearance of straightened teeth, just for the purpose of smile makeover. Dental implants are quite an effective way for restoring teeth, which have been lost or damaged. For serious cases, where trauma, cancer, surgeries and other factors have removed the tooth from the roots, dental implant is provided by the dentist in Delhi, so that the patient now has a normal looking tooth in that particular place. Many people have excessive growth of gums over their teeth, which is not to do anything with the abnormalities. It doesn’t look much good about the smile and hence, gum lifting is done by our dentists in the dental clinics in India. Removing excess gum tissues can be helpful and then the remaining gum is reshaped. In our clinics in Delhi, we carry out such gum removal or lifting procedures with the help of laser instruments, which do not cause any harm to the nearby enamel and also is less painful and less infectious for the patients. They can simply visit the outdoors and get these procedures done without spending a lot of time. When patients come to the dental clinic in India, we tell them in detail the issues which need to be taken care of, in the dental smile makeover. It is largely dependent on the number of procedures and types of procedures done in the patients. the more complex the procedure, the greater will be the expenses. For getting an assured beautiful smile, the costs are not very high, as we tend to provide the best possible services at lowest costs to the patients. The charges for various materials and operative procedures can add to the overall cost. When patients visit our clinics in India, we provide the best possible steps towards having the best smile for their faces. Hence, it is up to the patient to decide the processes to be done, and accordingly understand the expenses to be incurred. Smile makeover is a process which requires expertise in variety of fields. It is a work of many specialists at different sittings. Even though people will have to take the trouble of coming back again for a few times and spending some money, the effect is worth these troubles because after the process is over in our clinics in Delhi, the person has a transformed smile and facial appearance.